As much as I liked Route 72, at some point during my drive I started to long for something less “domesticated” that the gentle countryside of New Zealand Pacific coast. My intention was to turn into the Coleridge road just before Rakaia Gorge, to get to Lake Coleridge. Obviously that’s not what I did, as I never arrived to any lake. I instead ended up on a road getting soon unpaved (“unsealed” as a New Zealander would say), which was going through a beautiful glacial valley. 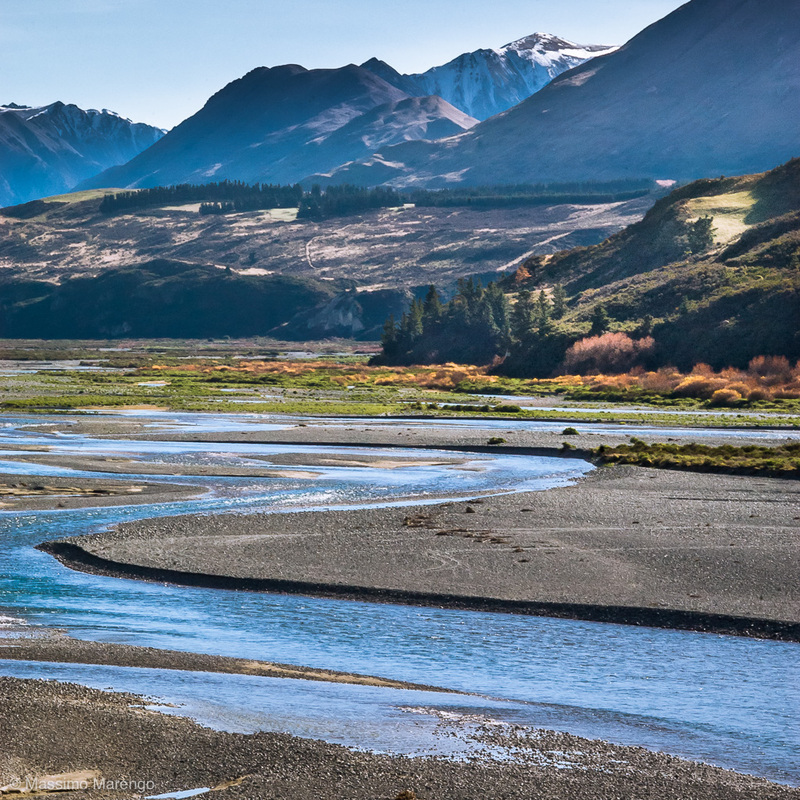 Now that I look at the map, it is clear that I got the Blackford Road, that then became the Double Hill Run Road, which climbs the shoulder of the Rakaia river on the opposite side of Lake Coleridge. The road goes on forever, on the shoulder of the valley, where ribbons of glacial water are braided in front of the usual majestic mountains. My Ford Focus was still going great, so I just kept climbing the dirt road. Now and then I stopped, because the valley was really beautiful. You can see it in the top photo, and in the panoramic at the end of this article. And I was basically alone the whole time, with the exception of a pickup truck of some farmer that passed me midway, a hiker (sorry “tramper” because in New Zealand you don’t hike, you go “tramping”), and some other friends I met along the way (pictured at the left). These cows were at the far end of their pasture, While I was taking photos of the gorgeous scenery during one of my stops. They noticed, and moved closer and closer, until I had trouble fitting all of them in the frame. I guess they were feeling alone and wanted some company. I stayed there for a little while, then we said goodbye and I went driving up the valley again. New Zealand is certainly a country with a lot of farm animals. Until not too many years ago there were over 70 million sheep; now the sheep are less than 40 million, still about 12 sheep every human inhabitant. The decrease in number of sheep is due to competition with other types of farm animals, including my cow friends, but also deers, ostriches, llamas and other exotic species. I can assure you that finding a llama or an ostrich in the hill country of New Zealand can be a quite unexpected encounter, but it did happen to us. 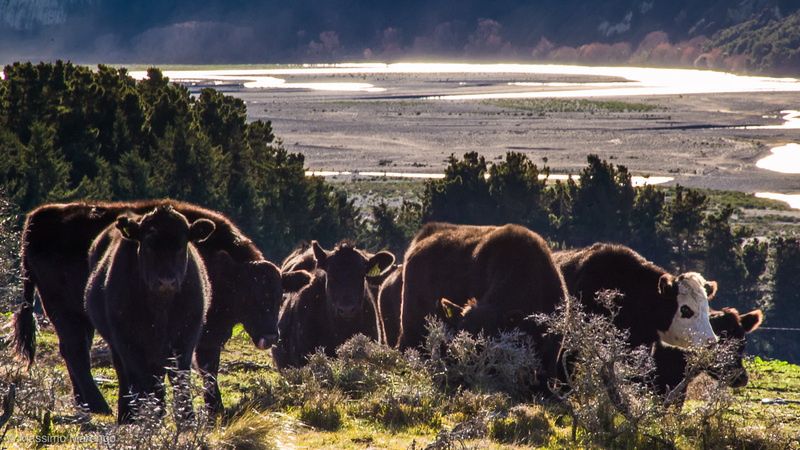 There are about 10 million cattle in NZ (equally divided between beef and dairy cattle), which still makes for a respectable 3 cattle each human. One can only hope that all these animals will not go the Orwellian way (how many pigs are there in NZ? ).